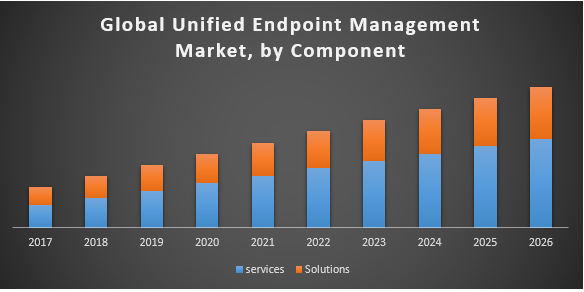 Global Unified Endpoint Management Market was valued US$ 900.80 Mn in 2016 and is estimated to reach US$ US$ 21656.09 Mn by 2026 at a CAGR of about 41.09 % during a forecast period. Global Unified Endpoint Management market based on component, organization size, verticals, and region. On the basis of component, the Unified Endpoint Management market is classified into services and solutions. In terms of organization size, the Global Unified Endpoint Management market is categorized into large enterprises, and small & medium enterprises. On the basis of verticals, the Global Unified Endpoint Management market is segregated into telecom & IT, BFSI, government & defense, retail, manufacturing, energy & utilities, healthcare, and others. Region wise Global Unified Endpoint Management is segmented into North America, Europe, Asia Pacific, Middle East & Africa, and Latin America. The necessity for a single unified endpoint management solution that can manage traditional and non-traditional endpoints is one of the most substantial factors proposed to drive the growth in the unified endpoint management market. In addition, improved awareness regarding the importance of data security in organizations is contributing to the growth of the unified endpoint management market. In terms of component, services segment is estimated to grow at the highest CAGR during the forecast period. The growing need to successfully implement unified endpoint management solutions across enterprises rising demand for specialized professionals. The necessity for appropriate training & support services, post the organisation of UEM solutions to ensure the effective management of endpoints, is anticipated to drive the growth of the services segment. By organization size, the Small & Medium-sized Enterprises segment of the unified endpoint management market is estimated to grow at a higher CAGR as compared to the large enterprises segment during the forecast period. This growth can be recognised to the increasing adoption unified endpoint management of solutions by Small & Medium-sized Enterprises to decrease operational cost and boost enterprise security. North America is estimated to lead the unified endpoint management market. The growth of the unified endpoint management market can be attributed to presence of key players such as IBM, Microsoft, Citrix Systems, VMware. BlackBerry, and MobileIron in this region. The necessity to safeguard data stored in the cloud and transmitted over networks is estimated to drive the growth of the unified endpoint management market in North America. 16.3.19. Amazon Web Services, Inc.
India Personal Computer Market (PC) – Industry analysis and Forecast (2018-2026) by Product, by Application. Business Intelligence Software Market – Global Industry Analysis and Forecast (2018-2026) – by Type, Deployment Model, End User, Application, Geography. Global Inductor Market – Industry Analysis and Forecast (2018-2026) – By Type, Core Type, Application and Region. Global Structural Health Monitoring Market – Vertical Analysis and Forecast (2018-2026) – By Technology, Component, Vertical and Region.